I had often wondered what to do with all those handmade precious doilies. Could I somehow use them as home decoration? I wanted to have them showcased and decided to make a unique piece of decorative art with them. Step 1. You need a canvas. You can purchase one or make your own (instructions here in an earlier post). Step 2. 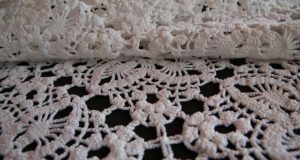 If you wish, you can cover the canvas with fabric or spray paint it to create a good looking background to present the doilies on. The fabric can be glued to the canvas by using spray adhesive, very easy to do. So much easier to use compared to runny liquid glue or glue stick. Spray adhesive is evenly spread, no more chunks of glue ruining the work. 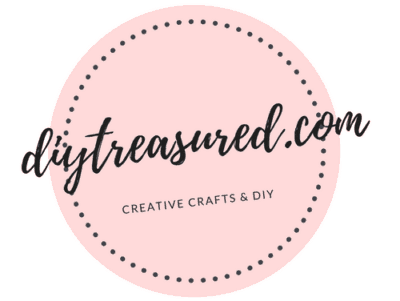 And it’s a mess-free product that you can use for all kinds of crafts. On heavier pieces you just need to spray it on both parts to glue together. After trying the product, I highly recommend. Step 3. 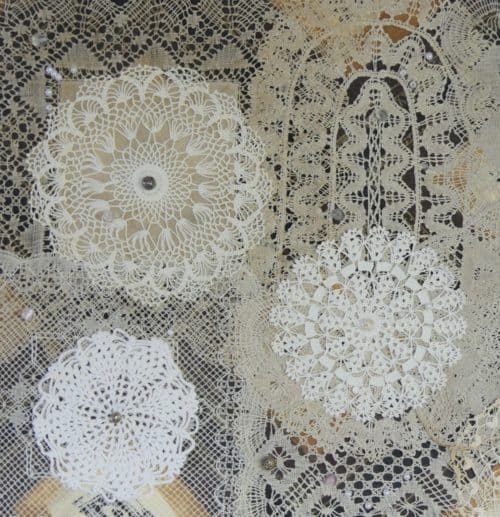 Plan how to place and in what order to glue the doilies on the canvas. Step 4. Have your canvas lay flat. Use spray adhesive to easily stick the doilies on canvas. First spray the adhesive on the fabric that is covering the canvas. Use the spray on every piece and place them as you’ve planned. 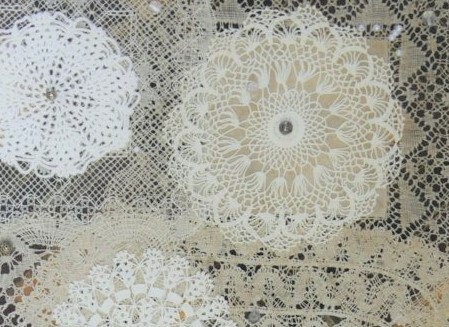 Apply the adhesive on the back of the doilies one by one, so it wont dry too soon. Let dry as instructed on the spray adhesive can. The adhesive will dry invisible, so no worries with the background of the doilies getting a little extra sprayed on. Step 5. For the finishing touch you could use pearls or anything suitable you could think of to add a little extra on your decorative art piece. 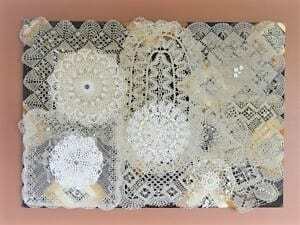 I liked pearls best with my doilies. I think they are a good match, both delicate and feminine. 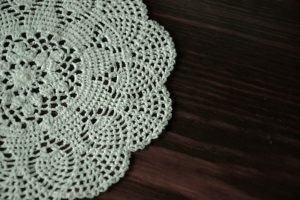 Now these precious doilies are presented the way they deserve. So glad I made this. Would love to see your version!